Willow Dee is one of our 2 caravans. ID 1053 is our other caravan and they are very close to each other. Ideal if larger groups want to book both caravans together, or of course, can be booked separately. Willow Dee has been Newly refurbished with new blinds, some new furniture, new décor and new flooring in lounge/kitchen. The décor is modern, contemporary and homely. 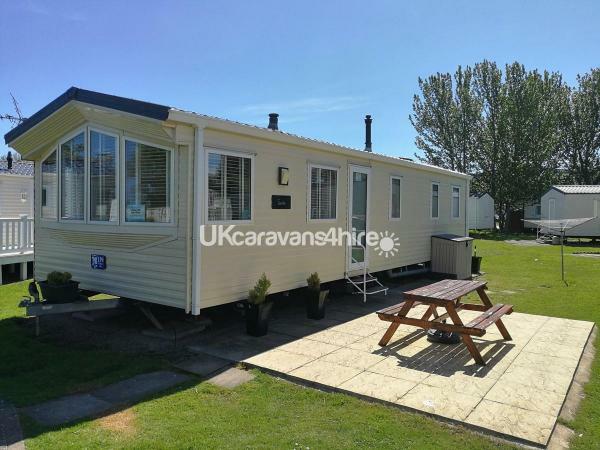 It is situated on a lovely plot looking out onto a large grassed area on the Lakeside caravan park within the Butlins complex away from the road so kids can play safely. 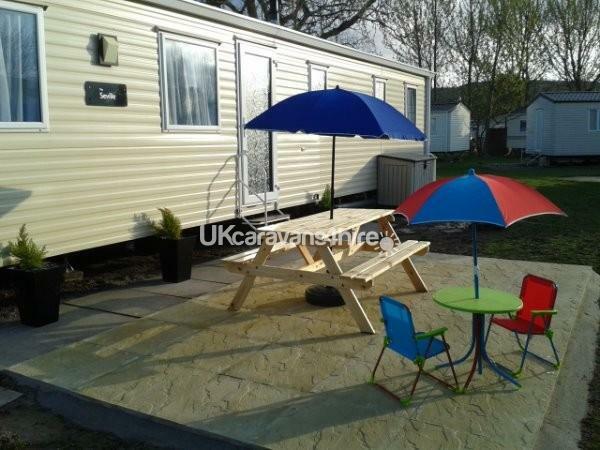 The caravan is on a nice large plot with a large paved patios and private grassed area. Hire includes access to the fair, Splash World indoor swimming pool with wave machine & flumes, live shows, soft play area, & wooden fort . There is fishing on the lake. Other facilities on offer such as go karts, crazy golf, bowling, cinema- are all available at an additional charge. There is an amusement arcade and several restaurants and pubs, a launderette , 2 supermarkets, Burger King and Pizza Hut. 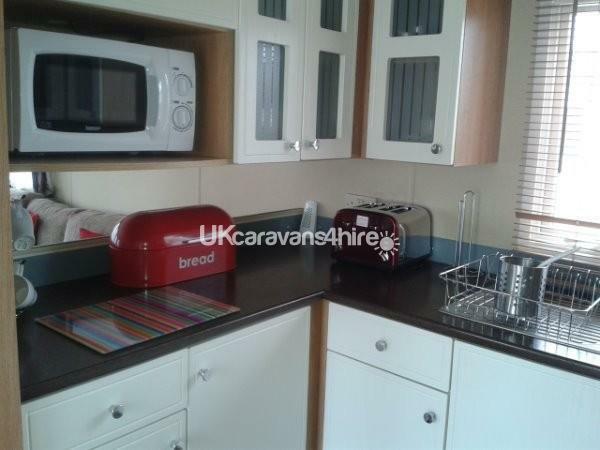 The caravan is double glazed and has a spacious lounge area with a gas fire, a shower room with basin and toilet. There is also an additional separate WC with sink. There is 1 double bedroom and 2 twin bedrooms & an additional fold out double bed in the lounge. 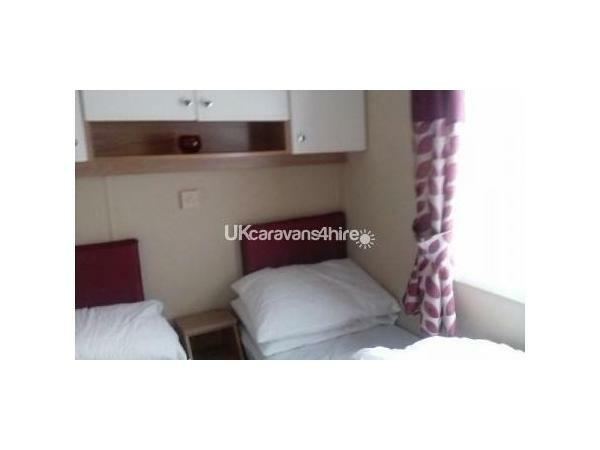 The caravan can accommodate up to 8 people although on adult weekend this is limited to a maximum of 6. Willow Dee has been equipped to a high standard and offers a 32" flat screen TV ,DVD player and a selection of DVD's, radio/CD player with MP3 connector lead. There is also a PS2 games console and hairdryer. The kitchen which has a full sized oven & hob, and a large FULL sized fridge/ freezer, has been very well stocked with kettle, 4 slice toaster, George Foreman health grill, microwave and cafeteria. Various sized plates, glasses and serving dishes and a variety of cooking utensils are provided. Guests with younger children will also find a selection of plastic plates, bowls and tumblers a bed guard, high chair, and travel cot. Outside you will find a large wooden picnic bench and a BBQ ( guests will need to provide their own charcoal) and a rotary washing line. There is a parking space for one vehicle near to the caravan but additional car parking is available on the main car parks. Gas & electric is included in the price. The caravan is fitted with smoke and carbon monoxide alarms. Butlins at Minehead is located across the road from a large sandy beach. A windbreak and beach parasol have been provided for guests convenience. The town of Minehead with further shops, pubs and restaurants is a 10 minute walk from the entrance at Butlins. Please note there are a few dates throughout the year which require additional tickets to be purchased such as the Maddness concert weekend. Please enquire for further details or view the Butlins web site. Guests will need to bring their own towels and tea towels. An additional £100 deposit will be required with all bookings against damages & breakages. This will be returned within 5 working days of inspection of the caravan provided all is in order. All lettings must include a responsible adult of at least 25yrs. There are restrictions on children during the Adult Music weekends. Please Note: There is a strict no pets and no smoking policy at this caravan . On Adult weekends a maximum of 6 adults per booking. Q. Is the availability calendar up to date? A. Yes the calendar is updated regularly and is up to date. Q:Do occupants of the caravans have access to all the facilities on offer at Butlin's? Q:What time can I access the caravan? Q:Can I arrive before 4pm? Q:On the day of departure do I have to leave the site at 10 am after I have handed in my key ?. A: No Butlin's are happy for guests to stay for the rest of the day. Q:How long do I have to wait for the return of the security deposit ? A: After inspection of property and no issues found, we aim to return the deposits within 5 working bank days of departure. However we have no control over the time it takes the banks to process payments. Q. How close is the allocated parking space and how many spaces? A. Right in front of the caravan. Space for 1 car but further parking can be found on Butlins main car parks nearby. Q. Can I make payments monthly to pay off the rental balance? A. Yes customers can pay off the balance in smaller monthly payments. 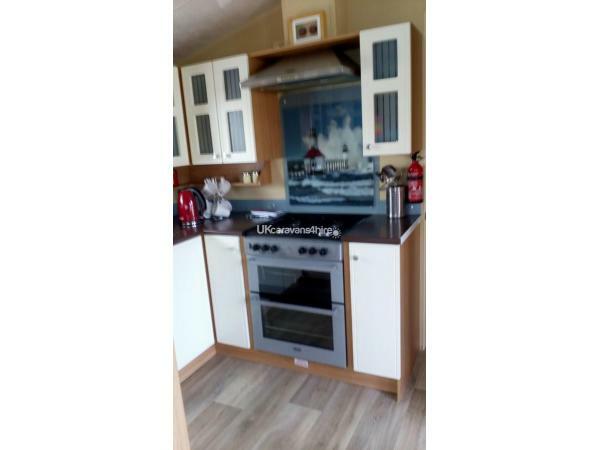 Got an amazing price on this caravan and were pleasantly surprised by all the extras provided such as children's cutlery, bed guard, box outside full of items for the beach etc. Can't fault the customer service and quick communication between myself and the owner, we arrived late on the Friday and sent an email questioning something and received a phone call explaining within the hour. Lovely area and lovely caravan. Thanks again. Thank you so much for the kind comments and so pleased you enjoyed the little extras we provide. Thank you. You are always welcome back! Thank you so much for your lovely comments, we always hope our guest won't need to use the umbrellas and hope for some sunshine, but we are glad you found them useful along with all the other little extras..
Had a fantastic week at butlins fun for all the family, plenty going on day and night. The caravan was unbelievable, very modern inside, spacious, well equipped in all areas also for the kids from a PlayStation to dvds, games for inside and out. Overall very much enjoyed 10 out of 10. Thank you! We are glad you enjoyed all the little extra's that we provide. Thank you for your kind comments. You are always welcome back. The caravan has everything you need. The best equipped van we have ever stayed in and we go away 3-4times a year in different vans on different sites.It is very family orientated, from the entertainment within the van (ps2,board games,books etc) to the kitchen equipment (plastic for the children),plenty of cleaning products supplied. All equipment in excellent clean,working order. Me and my husband stayed here with our 4 children age from newborn (4week old) to teenager and would recommend it to anybody. We will definitely be returning to this van.The owner was extremely helpful and the booking process was very quick and easy. Thank you for your kind comments- We love our van and we are glad you do too! Had a fantastic stay here my kids loved the PlayStation 2 & DVD ... Well equipped you definitely thought of everything... Thank you would definitely stay here again . Thank you for your lovely comments. We try to provide as much as we can for that home from home feeling so we are glad you enjoyed it. 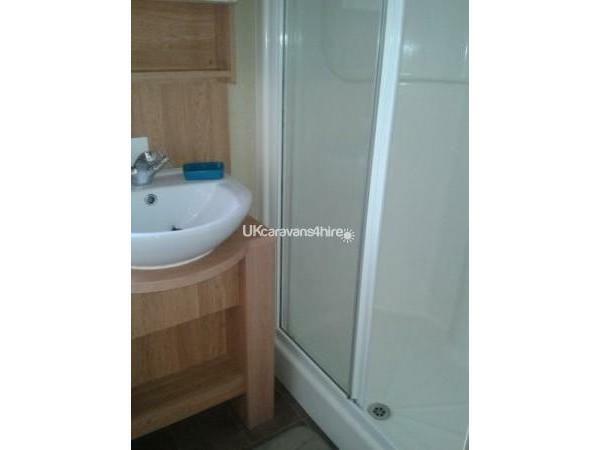 Great caravan, very clean and well equipped, including two loos. As in info pack no need for wipes or washing up liquid, all provided (very good service). Only a 5 minute walk to the beach and you have access to the Butlins site, fairground etc. 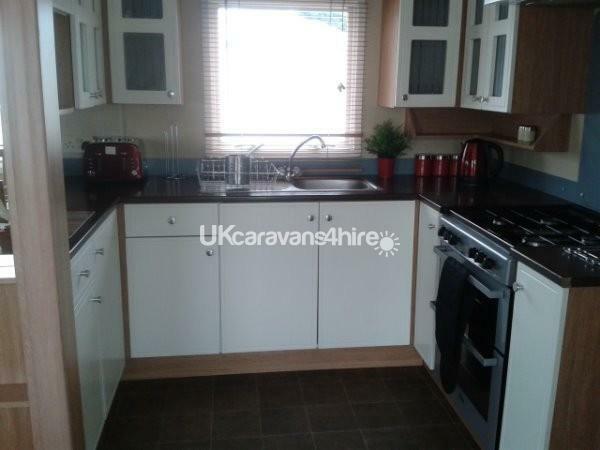 Caravan very spacious and in excellent plot with grassed surrounding. Tesco and Morrisons nearby for shopping (no inflated prices...unlike Centreparcs). Very good value for money had a great time, kids loved it. Thank you for your comments . Our aim is make our customers stay as comfortable and convenient as possible.